Over the past week (which happens from time to time), there have been several reports about DC United looking for sites to build a soccer stadium in the District. This time around, one of the leading sites under consideration is in Buzzard Point, specifically Akridge’s 100 V Street. Currently, 100 V Street is planned as a secure federal campus, but there have been no tenants lined up so far. Due to the size of the sites under consideration, the Greater Greater Washington blog contends that a stadium would be “urban” with few surface parking spaces and would fit within the current street grid (except for the possible closure of T Street between 1st and 2nd Streets). This site is located three blocks southwest of Nationals Park and if the soccer stadium is located there, the area would become a stadium district of sorts, akin to the Meadowlands (before the Nets and Devils left Izod Arena) or Philadelphia. 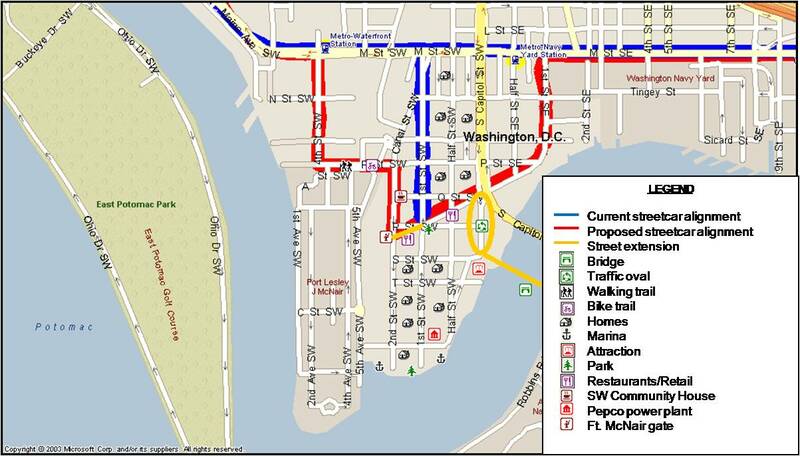 Linking the stadiums would be Potomac Avenue, which currently is lined mostly with industrial operations west of South Capitol Street. With a soccer stadium on one end and a ballpark on the other, Potomac Avenue could become an entertainment district with retail stores, bars and restaurants to cater to fans, as well as for neighborhood residents and employees at Fort McNair. The DC streetcar is planned to have a couple lines come down to Buzzard Point and possibly run along Potomac Avenue, which is a wide boulevard that would have room for a streetcar. Perhaps ferry service can be introduced on game days via James Creek Marina, located just to the southwest of the stadium site. While there are differing opinions over the effect that stadiums have on development nearby, a DC United Stadium in Buzzard Point may cause other projects to get underway that otherwise would take several years or decades to get built, including development on Potomac Avenue. The introduction of retail to the neighborhood, coupled with a streetcar line could help spur residential development in the area, like Marina Place, a planned condo project catty corner to the stadium footprint at 1st & V Street. Just to the east of the stadium footprint is the Buzzard Point Power Plant, which Pepco plans to decommission by May 2012. The power plant itself will most likely be landmarked, but perhaps can be repurposed as a cultural amenity like a museum or art gallery space. With the planned departure of the U.S. Coast Guard from its headquarters at 2nd & V Street to St. Elizabeth's in SE by 2015, perhaps that site can be redeveloped as a mixed use project that embraces its location next to the river and provide public access to the waterfront. Some of these ideas for Buzzard Point stem from a neighborhood study done in 2009 by the American Planning Association’s Planning Assistance Team (PAT). 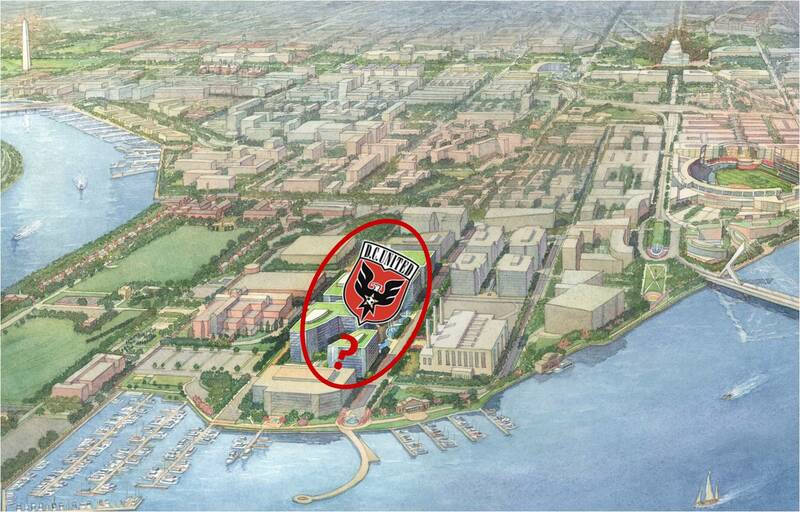 For now, talk about DC United moving to Buzzard Point is just that...talk. Who knows whether they will choose Buzzard Point over other areas under consideration and if they can obtain financing to build a stadium. However, it's fun to talk about what possibilities exist for Buzzard Point, with or without a soccer stadium in the neighborhood. Renderings courtesy of Akridge and Buzzards Point LLC. I'm not sure the Meadowlands or Philadelphia are really apt comparisons as bot complexes include football stadiums and large surface parking lots. However, I'm actually struggling to think of a really good comparison, perhaps this will be a rather unique district. It would be somewhat unique, with the lack of parking and the potential to be a truly urban stadium district (i.e. little-to-no surface parking, stadiums fitting mostly within the street grid). It's entirely possible that the combination of the ballpark and soccer stadium could provide enough "event" foot traffic that a neighborhood of bars, restaurants, retail, etc. could spring up and bring in residential development. Would be neat to see. The proposed proximity of the two stadiums reminds me of downtown Indianapolis, where there's no "designated" stadium area, but Conseco Field House (Pacers), Lucas Oil Stadium (Colts), Victory Field (Indians, AAA Baseball), among other sporting venues are all located within walking distance with retail, restaurants, bars, offices, and housing throughout. 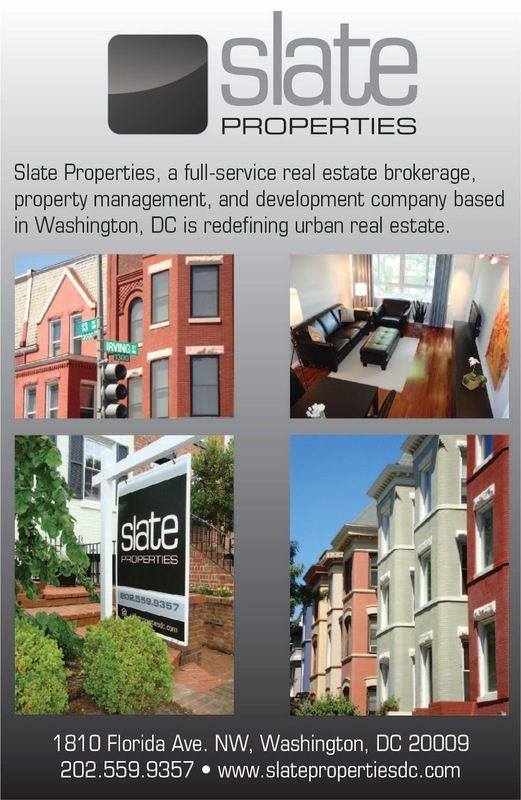 It makes for a lively downtown and could be very nicely replicated in SW DC. Like Lynn, I too immediately thought about downtown Indianapolis which I've always thought would be a good Olympics venue. 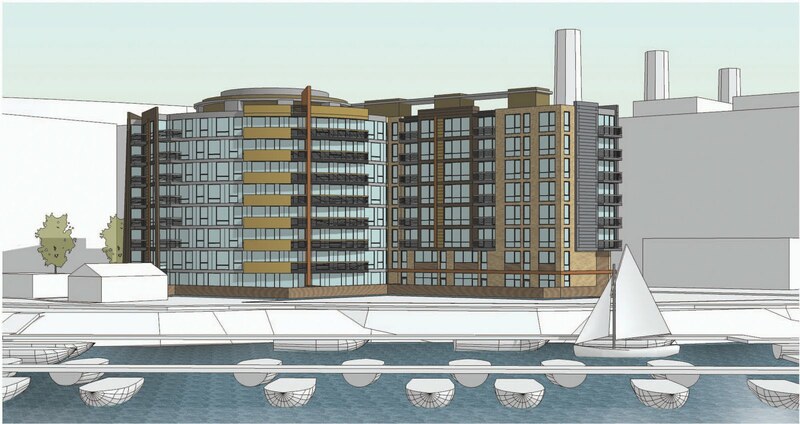 Yay for any development in Buzzard Point. Especially a soccer stadium. I believe Seattle has a similar model in SoDo. i really like the rerouted option (the red line on the map) for the streetcar lines.